Craving Apple Pie - but don’t want to make a whole pie? Here’s a great idea for you …… Mini Apple Pie Squares. A few years ago, I pulled this recipe from those stacks of recipe cards you get in the mail every once in a while. I had always wanted to give it a try. Last weekend I had one of those great weekends when all you want to do is relax and cook something special…… just for yourself. This was the perfect recipe. It only makes 8 small apple squares. I altered the recipe just a bit, since on the first try I really didn’t like the consistency of the crust or the taste of the filling, but I guess that’s why Faye and I are here …… WE try the recipes and make improvements, so by the time YOU give the recipe a try, you’ve baked something to be proud of. These Mini Apple Pie Squares have a wonderful crust, exactly what we all love about apple pie. 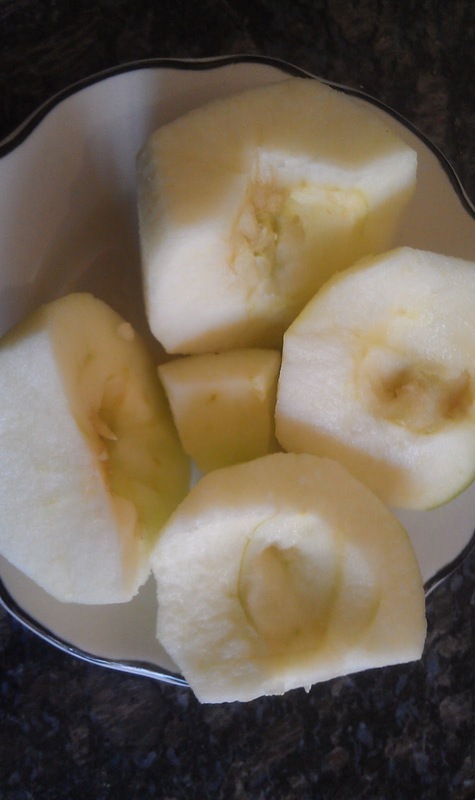 The filling is fresh, since the apples are not over cooked or processed like some apple pies ….. just the natural taste of great apples. I hope you give this recipe a try. It’s one that I definitely plan on making again. 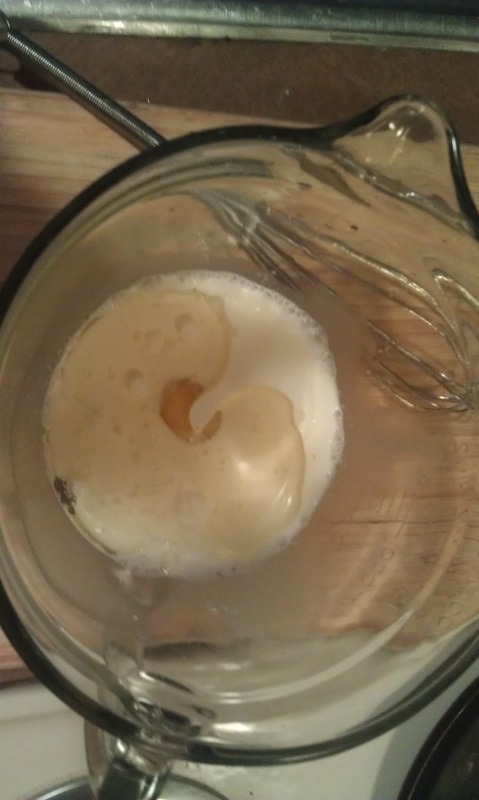 c. In a small bowl, combine the egg and milk till blended. d. Add egg mixture to the flour - using a wooden spoon - stir until the dough starts to form. 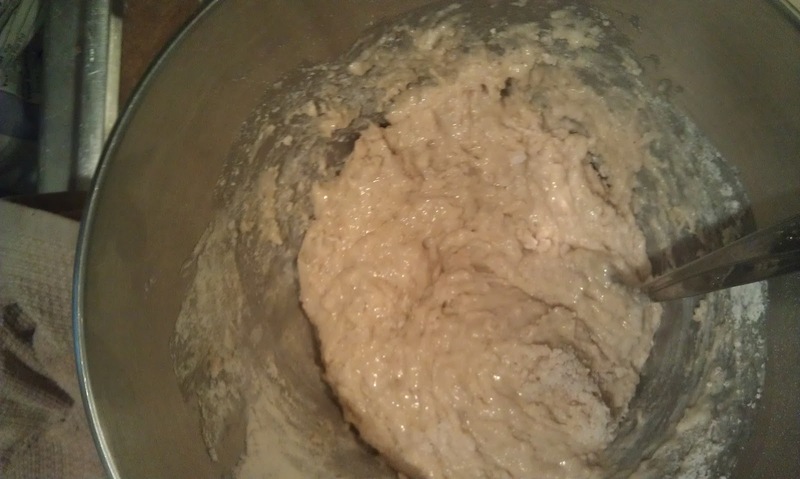 Make sure the flour and egg mixtures are well blended but do not over stir. Cover and set aside. a. Peel apples, cut in half and core the centers. b. 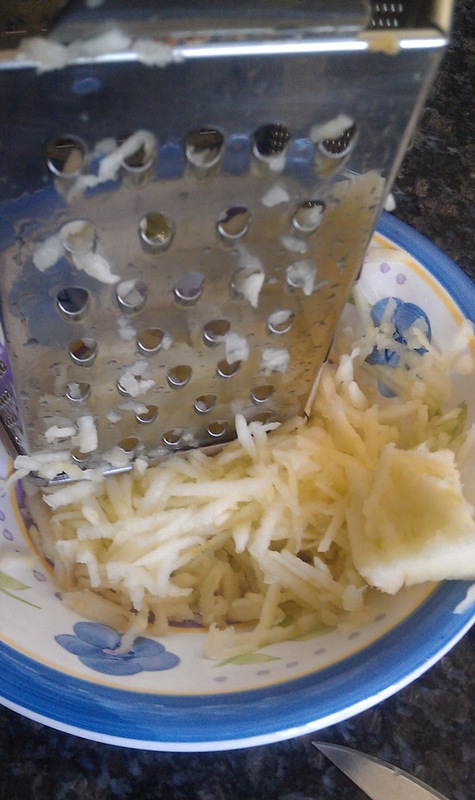 Using a cheese grater, grate apples and put them in a bowl. 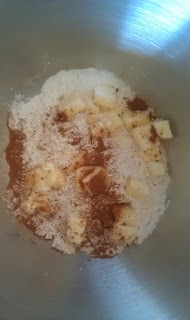 c. Stir in ginger, cinnamon and sugar. Set aside. a. On a floured surface, roll dough to about a 16”x8” square. Cut down the middle lengthwise, then cut each half into 4-5” squares. b. 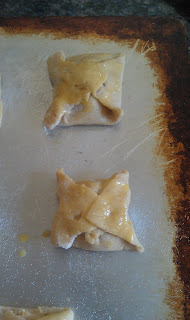 Place 1 tablespoon of the Apple Filling onto each square. 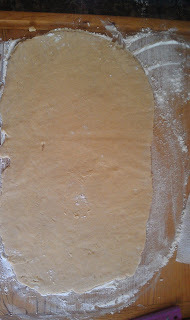 Using the beaten egg (from the Extras list), brush the edges (about ¼ inch) with egg. c. Taking the two opposite corners of the square, meet in the middle, pinching the corners together. Now take the other two corners and repeat - pinching together in the middle. The pie filling should be completely covered. e. Bake for 10-15 minutes - remove and cool. One of my family's favorite weekend breakfast dishes is the breakfast sandwich: Fried eggs, slices of bacon, ham or sausage and cheese all sandwiched between buttered toast. This breakfast is great because it can be customized according to the person's tastes and it's portable so you can eat it on the run! This weekend I decided to change it up by using these amazing Cheddar Biscuits instead of toast. The texture of the biscuit was perfect and the saltiness of the sharp cheddar cheese added another dimension of flavor. Feel free to use a mild or medium cheddar if you prefer a milder flavor. 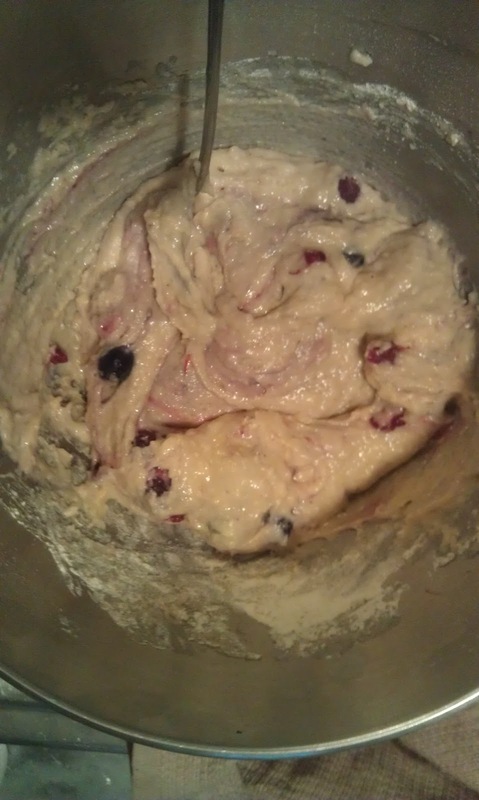 You could also add fresh herbs to the dough! Chives would be a great addition. 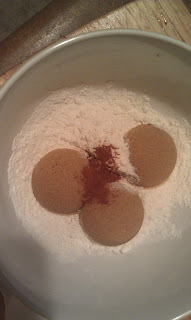 In a large bowl, combine the flour, baking powder and salt. 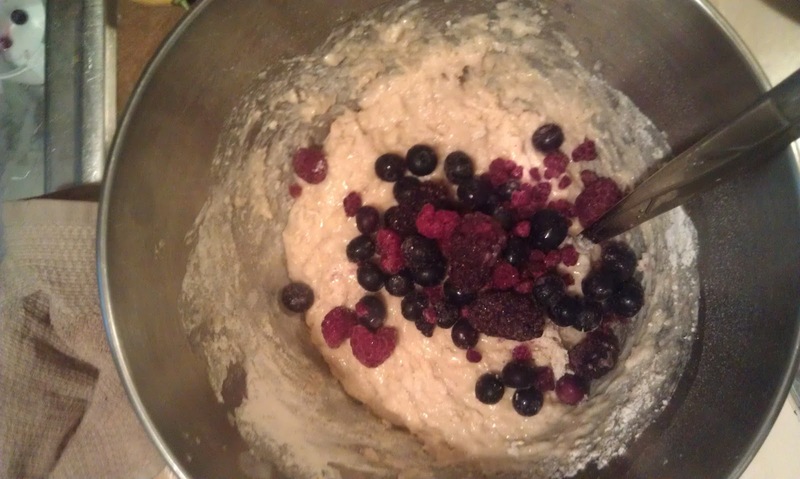 Refrigerate the mixture for 25 minutes. 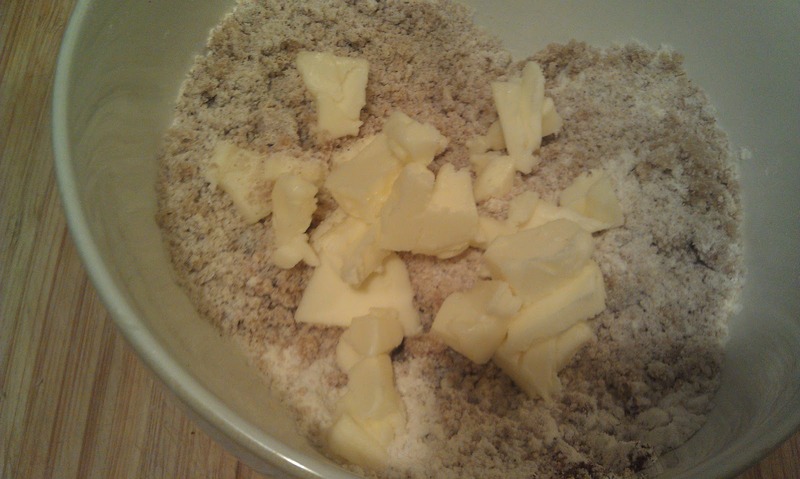 Cut the butter into chunks and leave out at room temp while the flour mixture is chilling. 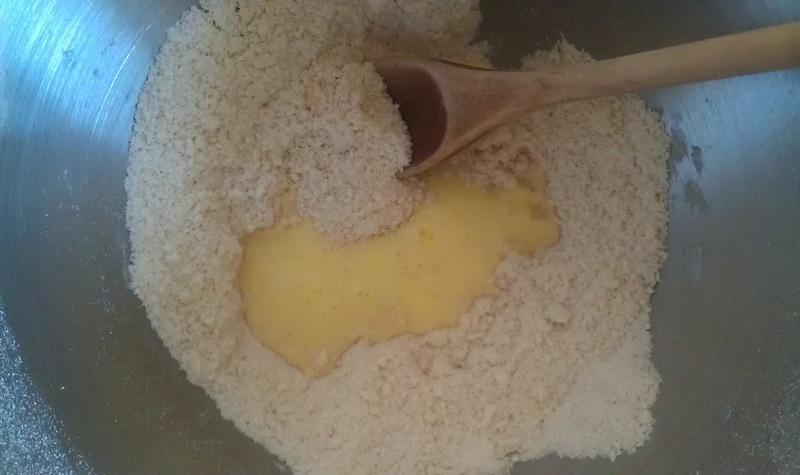 When the dry ingredients are finished chilling, place the flour mixture, butter and cheese in the bowl of an electric stand mixer. Mix on low until the chunks of butter are no larger than a large pea. This may take up to 1-2 minutes. 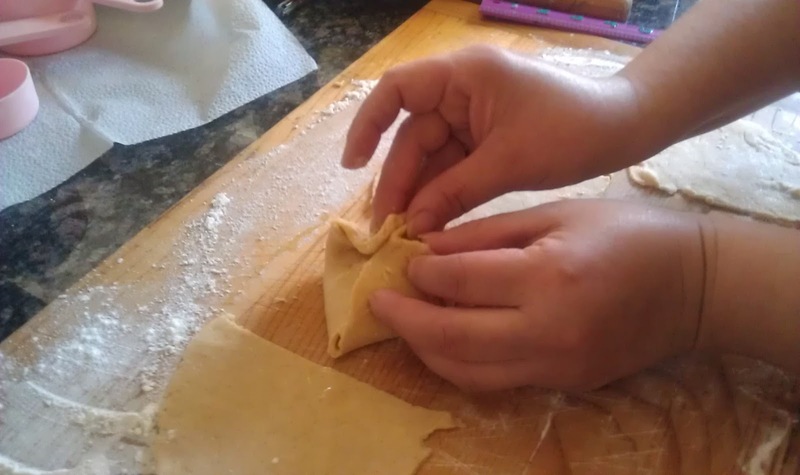 If you don't have an electric stand mixer, you can use a pastry cutter for this process. Cut the butter into the flour, then add the cheese and toss to coat. Add the buttermilk to the bowl and mix on low just until a dough forms. This literally only took about 10 seconds. Do not overmix. Turn the dough out onto a lightly floured surface. 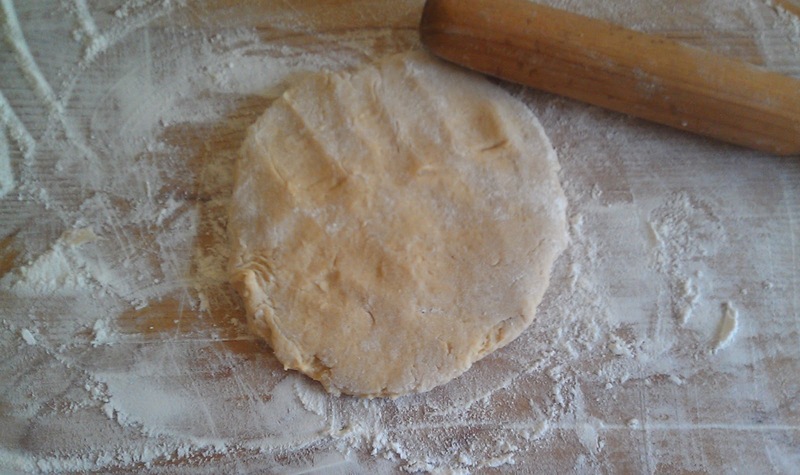 Coat your hands with flour and knead for a few seconds to bring the dough together then quickly and gently pat into a disk about 1/2" - 3/4" thick. 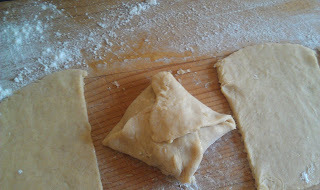 Using a biscuit cutter dipped in flour, cut the biscuits using a quick up and down motion. Do not twist when you cut your biscuits. Twisting seals the edges which can prevent them from rising. 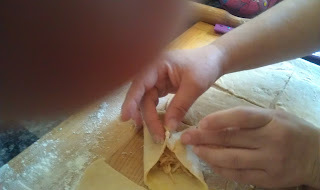 Gently reshape dough scraps to cut additional biscuits but do not do this more than once otherwise those biscuits will be tough. 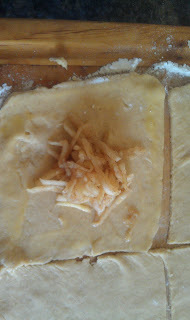 Place on a parchment lined baking sheet about 1-2" apart. At this point you can refrigerate your biscuits for about 20 minutes if you feel you may have overworked your dough during the kneeding/shaping process. Remove from the fridge and brush lightly with egg wash (1 egg with a splash of water whisked together). Bake at 400 for approximately 15-20 minutes or until golden. Remove from the oven and allow biscuits to sit on the baking sheet for 1-2 minutes then remove and serve warm! 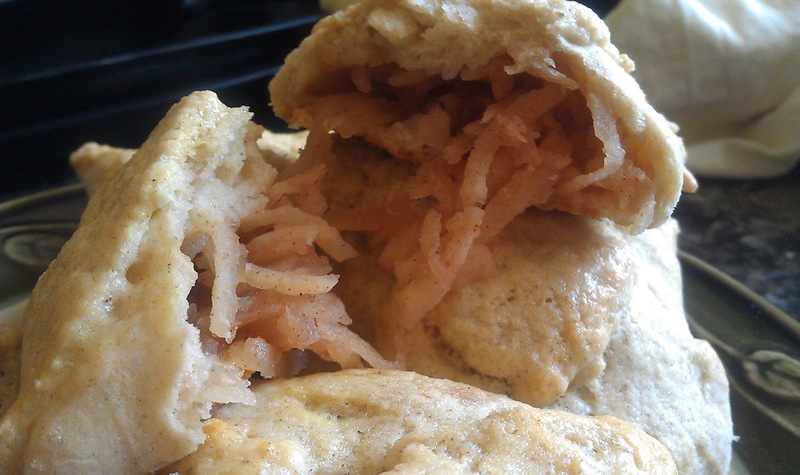 Leftover biscuits can be stored at room temperature tightly covered for one day. Reheat in oven or in the microwave for a few seconds. You can also freeze the biscuits and bake directly from the freezer as needed. 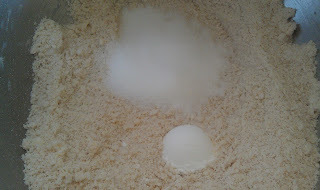 After placing the biscuits on the baking sheet and applying the egg wash, place the entire baking sheet in the freezer. 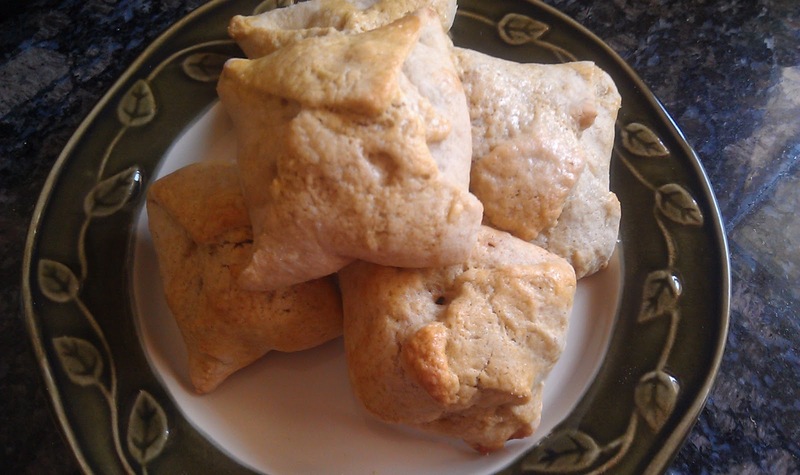 When the biscuits are completely frozen, remove from the baking sheet and place in freezer bags. When ready to use, remove from freezer, brush with egg wash and proceed as below but increase baking time as needed). Tip: If you don't have buttermilk on hand, you can make sour milk youself. Add 1 tablespoon of white vinegar for each cup of milk. Allow to sit at room temperature for 5 minutes. You can also use fresh lemon juice instead of the vinegar. Also if you don't like fried eggs, you can just use scrambled egggs or you can whisk a bunch of eggs with milk, salt & pepper, pour into a greased baking dish and bake until the eggs are set then cut and place on your biscuits! We hope you can make it out to Great News on April 28th to help support the National Food Bloggers Bake Sale to end childhood hunger in America. If you are unable to attend or don't live in the San Diego area, we are holding an online auction! A few of the items we are auctioning are not food-related & can be shipped to you. Food items will be baked fresh and hand delivered. Yvonne and I both work in the Action Sports industry so we thought it would be a great idea to include some non-food items in our auction! 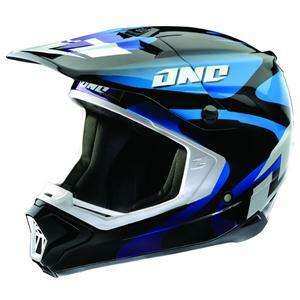 Starting bid for the Gamma Lava Lamp Helmet (size medium) retail value $270.00 is just $40.00! 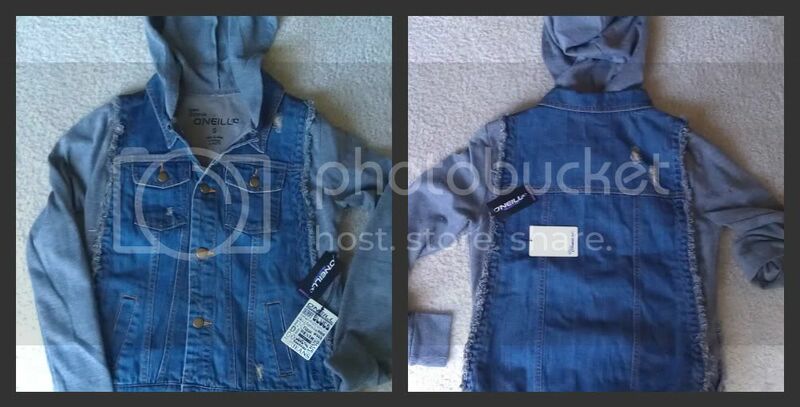 We are also auctioning off this cute O'Neil Girls jacket which is a combination denim vest and fleece hoodie. This jacket is perfect for layering on cooler California nights and would be great for the surfer girl in your life. Starting Bid for the O'Neil Girls Jacket (size small) retail value $68.00 is only $20.00! Now onto the sweets! Since cheesecake is my signature dish, this auction would not be complete without cheesecake. We are auctioning off 1 of the 4 choices below. 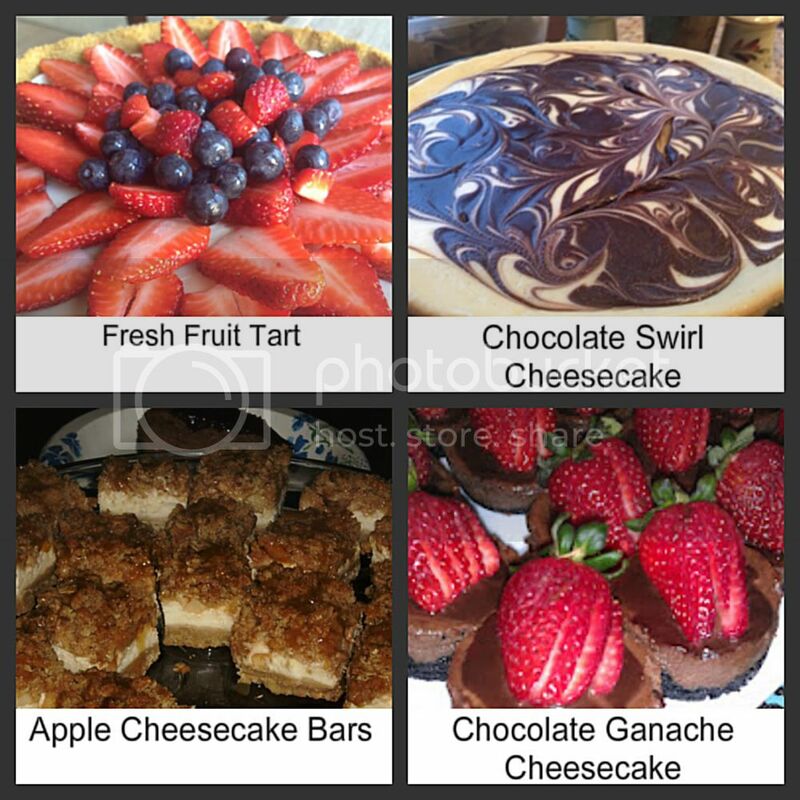 Starting bid for one of these delicious desserts is $20.00 (baked fresh especially for you the day before it is hand delivered). The Fresh Fruit Tart became popular when I was working at DC Shoes where it earned the name "Crack Tart" because it was so addicting. Made with a graham cracker crust and a thin layer of creamy cheesecake filling topped with fresh fruit, this dessert is so fresh and light you won't feel guilty eating it! Both the Chocolate Swirl Cheesecake and the Chocolate Ganache Cheesecake have an oreo cookie crust. The difference is whether you are a chocoholic like me (go for the Chocolate Ganache) or if you're more of a chocolate/vanilla swirl type person (in that case, the Chocolate Swirl is for you). The Apple Cheesecake Bars have a shortbread type crust, a creamy cheescake center topped with apples and an oatmeal crumble topping drizzled with caramel (whew, that was a mouthful!). 1. Add a comment below with your name, the name of the item(s) you're bidding on and the amount of your bid. We won't be mad if you want to bid on all of the items (seriously, we won't). 2. Bid back and forth until the auction ends Saturday, April 21st at 2:00pm (pacific time). 3. The lucky winner's name will be posted on Sunday and we will contact you to make arrangements. 4. Items must be paid for using this donation link by Wednesday, April 25th. Thank you from the bottom of our hearts for your support! Hmmmm… who doesn’t love cheesecake!? Well, these Fresh Blueberry Cheesecake Bars are exactly that. Yummy! I wanted to make some sort of cheesecake item for Easter this year. Cheesecake is always a hit in our family -- (Faye has a recipe that is delicious!) Since I knew we were going to have quite a big group this year for Easter I wanted to make desserts that were easy to grab …… so this year my Easter basket included: Oatmeal Peanut Butter Chocolate Cookies, homemade Vanilla Cupcakes with Buttercream Frosting and these delicious Fresh Blueberry Cheesecake Bars. The bars were the perfect size to get your cheesecake fix without having to eat a whole cheese cake. The cheesecake had a sweet vanilla-lemon flavor with a burst of blueberry in every bite, and the crust, with its addition of sweet coconut, added just enough texture to complete this bar. I truly loved this cheesecake bar and will keep it in my ‘go-to’ file for the future. Enjoy …. And Happy Cooking everyone. 1. Line a 13x9x2 inch baking pan with foil. Leave enough on the sides so you can easily lift bars from the pan once cooled. a. melt butter in small sauce pan at medium heat. 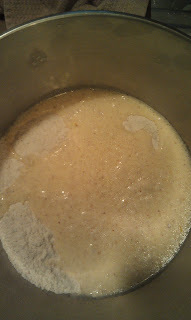 Continue to stir until butter is a light golden color. Remove from stove. b. 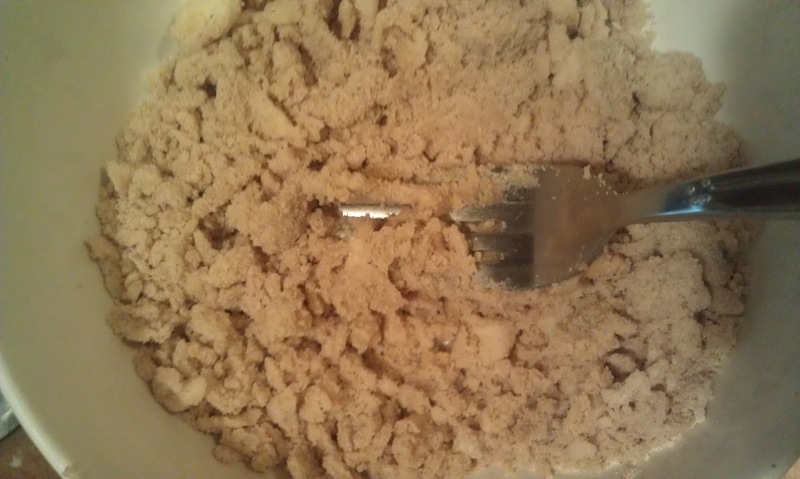 In a bowl, mix together the graham cracker crumbs, flour, pecans and sugar. Add coconut. c. Add butter to the mixture, stirring until all the ingredients are well combined. d. Pour crust mixture on to the 13x9x2 baking pan. Spread out evenly to cover bottom and press down lightly. e. Bake crust for 10 minutes until crust is lightly brown. Remove from oven. f. While crust is baking, start the filling. a. 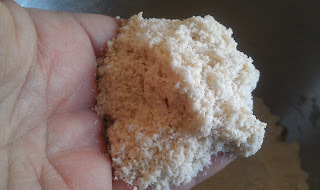 In a large bowl, combine cream cheese and sugar, beating until well blended. b. Add eggs one at a time, beating after each addition. c. Add heavy cream, vanilla and lemon juice to the cream cheese egg mixture. 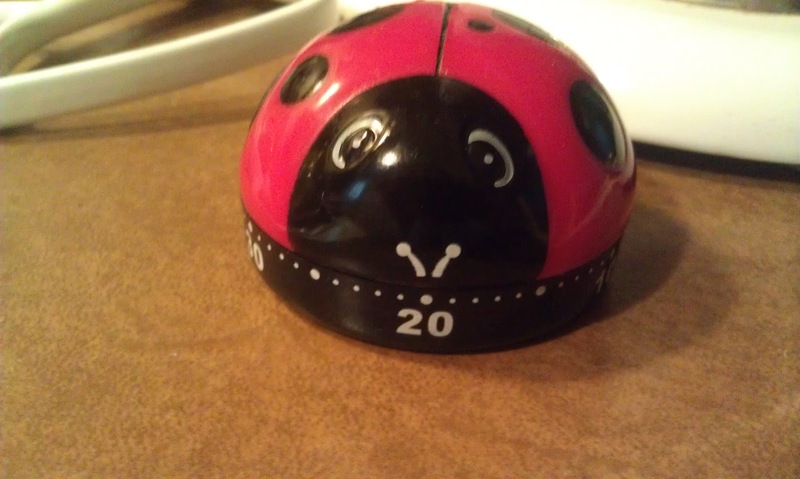 Beat an additional 2 minutes. e. Sprinkle the fresh blueberries evenly over cream cheese batter. 4. Bake for 20 minutes at 350. Check to make sure that the middle has set with either a fork or tooth pick. It should come out clean. 5. Cool in the pan for about 30 minutes. Using foil edges, pull bars out of pan and cool another 30 minutes. 6. Cover and refrigerate for a few hours or overnight. San Diego, mark your calendars, it's almost time for the National Food Blogger's Bake Sale! I can't tell you how excited we are about this event!! It's no secret that Yvonne and I love food (hence the Food Blog), more specifically we love to bake, share food with others & support worthy causes. Now we get to do all three! Please join us by supporting this Bake Sale in support of Share Our Strength No Kid Hungry Campaign. All proceeds will go towards helping to end childhood hunger in America. 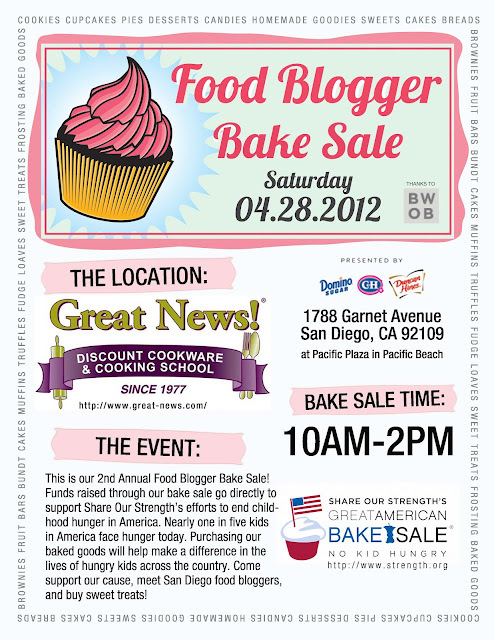 There will be some amazing baked goods on sale from some of San Diego's best bakers and Food Bloggers. LiveBakeLove will have some of the amazing desserts you've seen on our Blog, like these incredibly delicious Neiman Marcus "Louise" cookies, these over-the-top decadent brownies, Colleen's Snickerdoodles and Teresa's French Macarons just to name a few, plus we have some new treats in store for you as well. If that doesn't have your mouth-watering, we will also be having an auction on LiveBakeLove and there will be cheesecake involved (details to be announced soon). So please save the date and plan to join us for this special event. If you can't make it to this amazing bake sale or live outside of San Diego, you can still support the cause by making your donations here. Every little bit helps. Just $1.00 can provide a child struggling with hunger with 10 healthy meals and $4.00 can provide a child with a backpack filled with enough healthy food to last a weekend. That's probably less than you spend on your morning latte! I have to give props to Great News for hosting the event for the 2nd year. Great News is actually my favorite cookware store in San Diego and I've attended several of their cooking classes. They have an amazing selection, their prices are great and the employees are so friendly and knowledgeable. Whether I need cookware, bakeware or specialty ingredients, I don't shop anywhere else! I also have to give a huge, from-the-bottom-of-my-heart thank you to Marie @ Meandering Eats for putting this whole thing together. With over 40 Food Bloggers from San Diego participating, I'm sure it was no small feat! Can't wait to see you at Great News! Believe me, you won't want to miss it so get there early! If you enjoy baking… actually if you enjoy baked goods but don’t want to drive down to the store to get something sweet, this recipe is perfect! 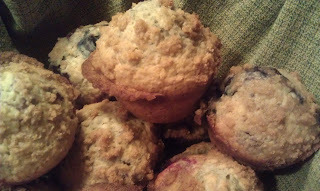 I usually crave a nice warm muffin on Saturday or Sunday mornings with a frothy cup of hot chocolate. 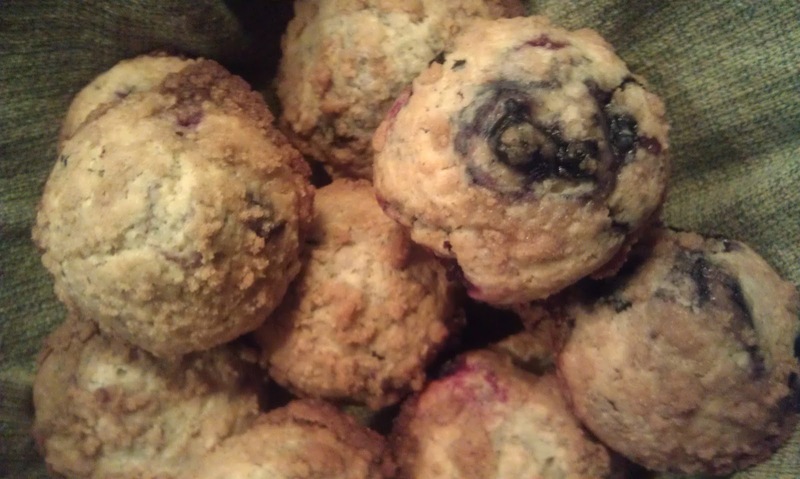 But, instead of getting out of my PJ’s and driving down to the local bakery, I choose to bake my own muffins in just a matter of minutes. 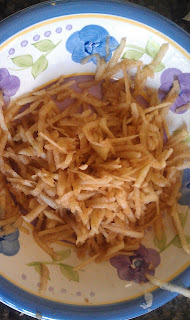 The reason I like this recipe is that it is easy, you usually have all the ingredients in your kitchen and it tastes delicious. I cannot even tell you how many times I have made this recipe and the numerous variations of muffins I have created. These muffins are fluffy, moist and have just the right amount of sweetness to satisfy any sweet tooth. If you have a little extra time, I say add the streusel topping. But with or without it they are just as delicious. Happy cooking everyone. 2. In a mid-size bowl, combine flour, sugar, baking powder and salt using a whisk (or a fork works just as well). In the center of the bowl, make a well. 4. 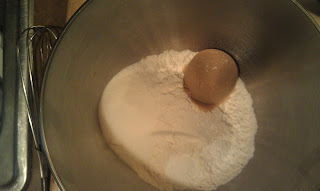 Add the egg mixture to the well in the flour bowl. 5. Stir using a large spoon until the flour is incorporated into the egg mixture. Add any of the Optional ingredients listed above at this time. Do not over mix. 6. 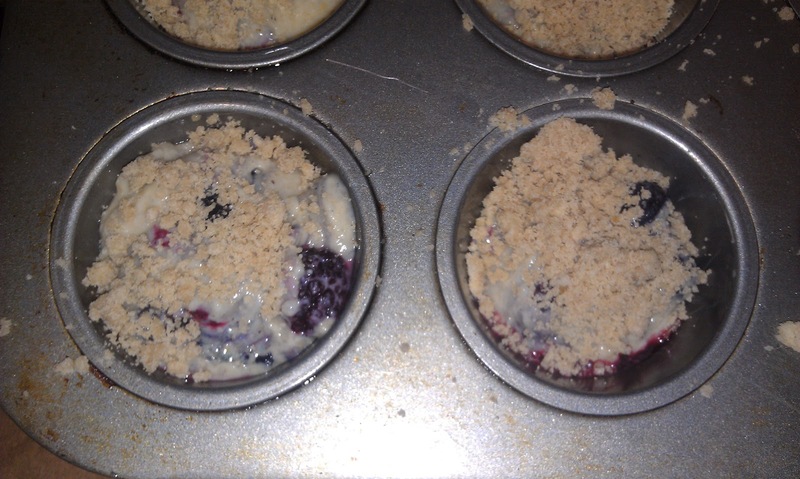 Spoon the batter into muffin cups. Fill cups about 2/3 full. If you are adding the Streusel topping. Add at this time evenly on each muffin. 7. Bake at 400F for 20 minutes. (Until golden brown). Remove from oven and cool for 5-10 minutes. 8. ENJOY! 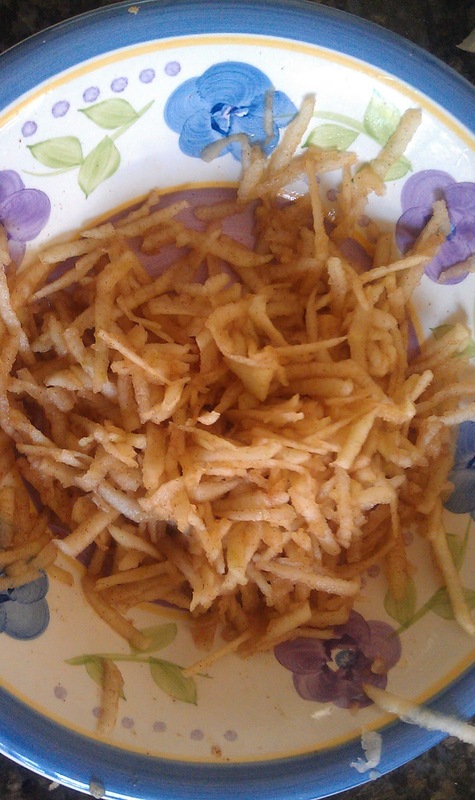 Serve with butter, yummy! Directions: combine flour, brown sugar ,cinnamon. Using a fork, combine butter into the flour mixtures until it resembles a coarse crumbs. Mix in nuts.